This week at my supervisory management course, we learned about something I wish every single one of my colleagues would learn: how to have an effective meeting. As I am one of only a couple of faculty members in this course, it was quite startling to compare/contrast the types of meetings I am used to, to the types of meetings my colleagues on staff have. I would say that many faculty meetings have a lot of talking. In fact, in recent meetings that I have run (poorly), all I did as the meeting lead was stand at the front, mentally note who raised they hand when, and make sure people spoke in order and didn’t trample over each other. We spoke for over an hour! Just talking one after another. I also took notes in a notebook or on a black board so that I could transcribe them later. There are so many things wrong with how I run my meetings, it is ridiculous. But, these meetings are weird, because they are between a bunch of people who are basically equals who all like to talk – a lot, and all think that they are the smartest person in the room. That makes faculty meetings harder. When I have a lab meeting, where I am clearly the top of the hierarchy, they run very differently – maybe more like my counterparts’ meetings. I run the meeting, I set the agenda. People talk and comment, but I control it and don’t let it derail. Actually, sometimes I do let it derail because I like to make a fun environment and chatting is part of that. What is the definition of an effective meeting? Meetings are effective when the goals of the meeting are achieved using a minimal amount of time and all participants are satisfied. Most meetings can be classified into two types: Information and Decision Making. Information meetings are used to convey information to a group or convince a group of something. Decision Meetings are used for goal setting, problem solving, and action planning. Most of the meetings I seem to have in academia, both with my research group and with colleagues on committees seem to be the second type. Straight information is (thankfully) usually conveyed in email format. Although sometimes it is useful to convey information in verbal forms (if it might get people upset, for instance). 4 points is your meetings always have this. ____ Seating in the room is arranged so that every person can see everyone else. ____ Equipment is available at the front of the room to record ideas/plans. ____ Your meeting has an agenda. ____ The agenda has time estimates for discussing each topic of the meeting. ____ At least 1-2 times in the meeting, there is a probe into how effective the meeting is going. ____ During the meeting someone records the ideas and decisions of the meeting. The data is prepared and handed out afterward to all concerned. ____ Meeting notes indicate who has agreed to do what before the next meeting. ____ Dates of future meetings are set in advance so people can arrange to attend. ____ Those in attendance decide who else should be involved for future meetings and those people are included. ____ At the end of the meeting, people review and confirm who is doing what. So, how did you score? I score quite badly (about 13 out of possible 40) – getting a zero in many of the attributes. I often do not have an agenda and it certainly doesn’t have times set for each part. We always have a place to write notes – chalk/white board and projector, but most of the time someone doesn’t take note. I usually take notes, but sometimes I don’t have the time to transcribe and distribute them. Have you ever been to a meeting where it was stopped and someone asked how it was progressing? Big, fat goose egg on that one for me. Never, ever happened ever. Dates of meetings set in advance. Does 24 hours ahead of time count? Are these things feasible to do at meetings in academia? 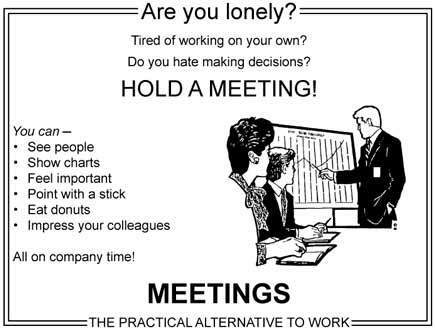 I think they are, and I think it would make meetings more useful and less dreaded. I am going to endeavor to implement these attributes into my meetings from now on. I hope my colleagues say, “I love having meetings with WomanOfScience running them. They are so efficient and effective. We get stuff done without wasting time!” OK, that might be wishful thinking! What do you think? Post or comment here. To get an email every time I post, click the +Follow button.